I put a lot of time and effort into the aforementioned material, so that you can answer all of your PROP_DESIGN related questions on your own. The material also covers topics that PROP_DESIGN users may find relevant. The Fortran 77 source code files have always been the primary reference documents. The source code is responsible for the actual calculations. All other support information merely helps to understand what the source code does or how to work with it's output. Due to all of the recent changes, there has been an increase in the number of bugs. If you think you found a bug, please report it using the contact form below. If you have any questions on how to use the program, feel free to ask. Lastly, I'd love to know how well PROP_DESIGN compared to test data. The contact form will only be available temporarily, as I normally do not provide any support for the program. This has mainly been added to combat any bugs. These products were chosen as PROP_DESIGN examples, because they cover the typical operating range of aircraft propellers. These products were designed, built, and tested prior to the existence of PROP_DESIGN. The PROP_DESIGN example input files are based on information found on the internet. Thus, the PROP_DESIGN example designs may or may not be similar to the actual product designs. 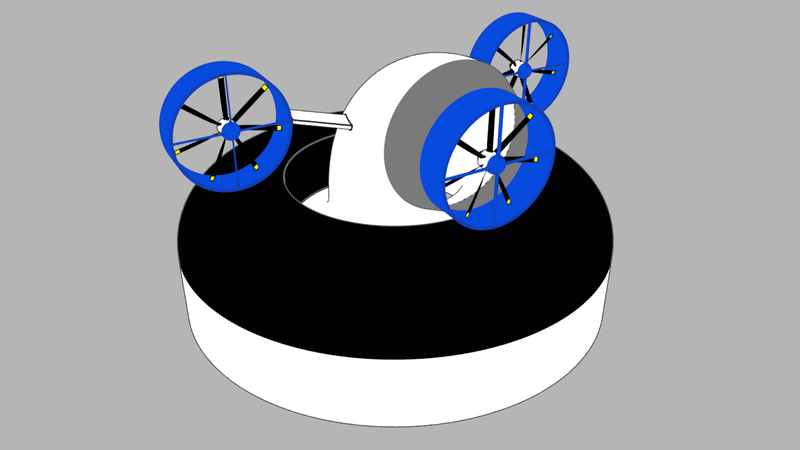 The hovercraft and VTOL examples are intended to show how PROP_DESIGN integrates into vehicle design projects. The modern turbofan example was done out of curiosity and proved to be very enlightening. I believe all PROP_DESIGN users will find this example to be very interesting. More information regarding the hovercraft, VTOL, and modern turbofan examples is below. 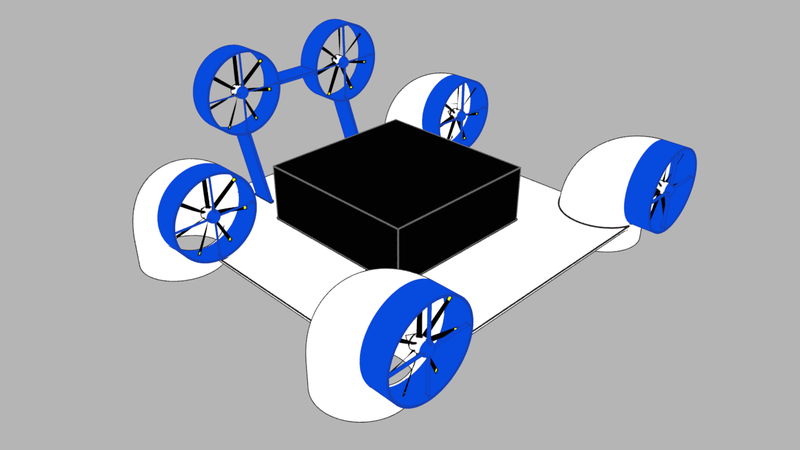 More information regarding the propeller with stator concept and example is located near the bottom of the concepts page. I have never seen anyone use a stator with a traditional aircraft propeller. This is why I have it listed primarily as a concept. Below is an application of a diffuser. Moreover, a diffuser was used to create static pressure for the plenum chamber of a hovercraft. The diffuser is shown in gray. The ducted fans are shown in light blue. 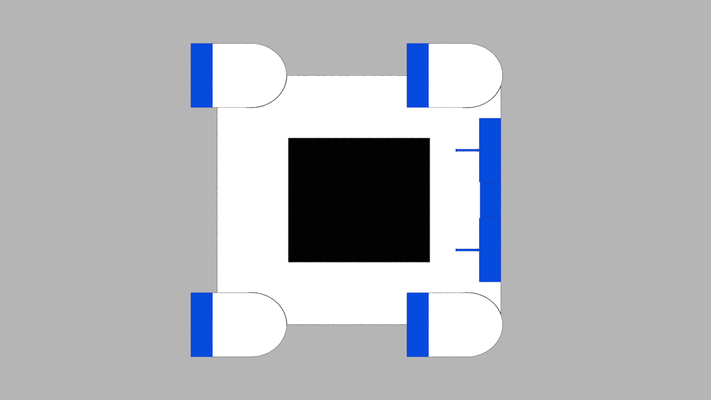 The plenum chamber is shown in white. The parts in black are where the cargo and/or passengers would go. 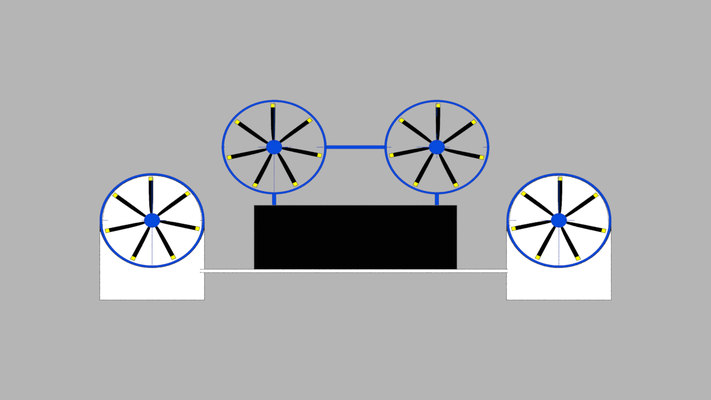 The hovercraft and VTOL examples use the same fans. The hovercraft example uses half the fans of the VTOL example (3 out of 6 fans). Thus, the hovercraft example uses half the power of the VTOL example. 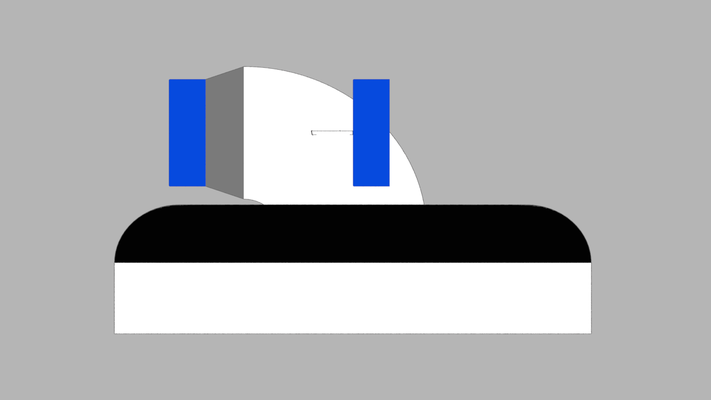 The hovercraft example can lift approx. 3x the weight of the VTOL example, while only using 25% of the thrust (1 out of 4 fans). This comes with one major limitation, hovercrafts can only float inches above the ground. 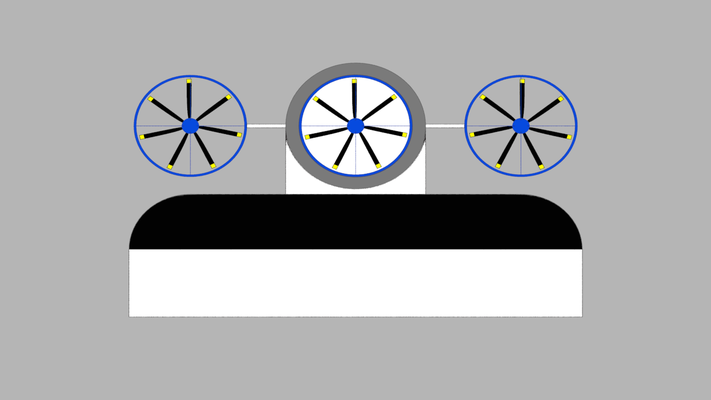 The hovercraft example has a lift-to-thrust ratio of approx. 11.7 at takeoff. Traditional aircraft are more efficient than hovercraft. Wings made with NACA 65A009 airfoils have a lift-to-thrust (i.e. L/D) ratio of 26.8. Traditional aircraft are about as efficient as a typical car or truck. Cars and trucks have a lift-to-thrust ratio (i.e. W/D) ratio of 33.3. Below is an example of a VTOL aircraft. The ducted fans are shown in light blue. 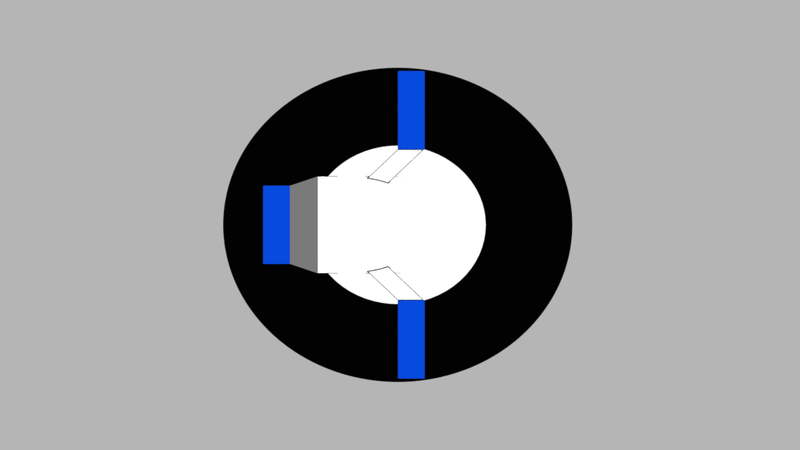 The fixed position thrust vectoring nozzles are shown in white. The parts in black are where the cargo and/or passengers would go. VTOL aircraft will be more efficient than helicopters and quadcopters. They will also be able to travel at much higher speeds. This is due to the air flow into the blades. An axial flow orientation is ideal. However, VTOL aircraft are much less efficient than traditional aircraft. All VTOL have a lift-to-thrust ratio of one. Wings made with NACA 65A009 airfoils have a lift-to-thrust (i.e. L/D) ratio of 26.8. So VTOL aircraft should only be used when absolutely necessary. I used PROP_DESIGN to study modern turbofans. This stemmed from the newly created flying wing concept. 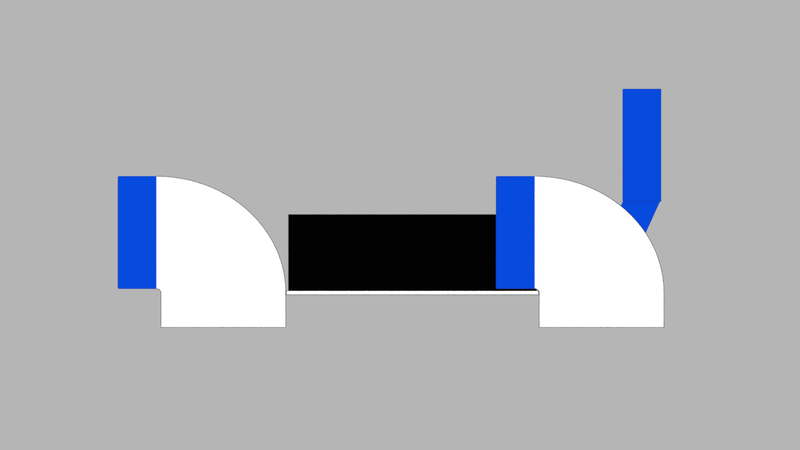 I wanted to see what sort of ducted fans I could create using PROP_DESIGN. Below are pictures of an optimized ducted fan design that could be used on typical transport aircraft or the flying wing concept I posted recently. It has a propeller efficiency of approx. 91.5% at cruise conditions of Mach .7 32,000 feet. It makes 26,851 lbf of thrust at takeoff. The cruise thrust is 3,539 lbf. Using four engines, the aircraft could have 14,156 lbf of drag at the cruise condition. Power at cruise for all four engines would be 19,425 shp. Power at takeoff for all four engines would be 118,593 shp. Fan efficiency at takeoff is 47.7%. Mass flow rate at takeoff is 2,980 lbm/s for one engine. Mass flow rate at cruise is 639 lbm/s for one engine. There are 22 straight blades with a diameter of 111 inches. As always, NACA 65A009 airfoils are used, due to their excellent transonic performance. The strut, hub, and duct geometry were shaped to reduce drag as much as possible while maintaining free-stream velocity through the duct. To maximize thrust, the radius/chord ratio is 2 (rather than the typical value of 10). This yields about 5x the thrust while maintaining the same efficiency. The use of a duct adds about 20% thrust at takeoff with a 10% boost in fan efficiency at takeoff. However, a duct adds a lot of weight and drag. Lastly, here are some renderings of the modern turbofan example, made specifically for use as desktop wallpaper.